This article is in conjunction with the article ‘Tracking offline conversions in Google Analytics‘ where I explained in great detail how you can optimize your online marketing campaigns for offline conversions by tracking website form leads and phone call leads through CRM and call tracking solution. In this article, you will learn to optimize your Google Adwords campaigns for offline conversions via offline conversion actions and Conversion Data Import. Many businesses use Google Adwords to promote and sell their services. But since services usually have long sales cycle and no fixed price, majority or all of the conversions tend to happen offline over the course of days, weeks or even months. Since neither Google Analytics nor Google Adwords track offline conversions by default, advertisers who promote their services via Adwords, have hard time understanding the performance of their adwords campaigns and where their money is being spent. This problem is also very common for businesses which rely on Google Adwords to sell products which can’t be purchased online (like properties, cars, heavy equipment, construction machinery, swimming pools etc). 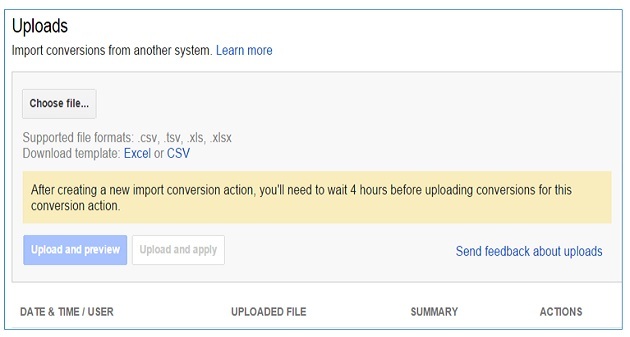 In order to optimize your Adwords campaigns for offline conversions, Google provides a feature in Adwords called ‘Conversion Data Import‘. I will talk more about this feature, later in the article. The two most common type of leads for a website are web form leads and phone call leads. These leads can be further classified into qualified leads and won leads (the leads which converted into actual sales). In order to optimize your Adwords campaigns for offline conversions, you need to learn to track qualified and won leads, for both lead generation forms and phone call numbers embedded on your website. #1 Traditional Method – you import web form and phone leads as conversions from Google Analytics into Google Adwords. Here we are assuming that you are already tracking form and phone leads as conversions in Google Analytics. #2 Creating offline conversion actions – through this method you import offline conversions directly into Google Adwords. No need to first create and track offline conversions in Google Analytics and then later import the conversions into Google Adwords. In the present article I am going to explain the second method in great detail. #1 User clicks on a Google Adwords ad. #2 Google Adwords automatically appends GCLID (Google Click ID) parameter to the landing page URL (provided autotagging is enabled). When you enable autotagging in Google Adwords, a unique ID is appended to the end of the destination URL of your adwords landing pages at run time. This unique ID is called GCLID. Each ad click has its own GCLID value. GCLID parameter is used to share Adwords campaign data with Google Analytics. Without GCLID parameters, your adwords data won’t pass into Google Analytics. #4 The user browse the website and then see your special phone call tracking number for adwords. #5 The user calls the tracking number. #6 As soon as the call is made, PCTS assigns user’s website usage data to the call and send phone call data as a lead along with the GCLID value to your CRM software (provided you are using a CRM which can integrate with your call tracking solution). #7 You or your staff, qualify and categorize the phone call lead via the CRM. So if a qualified lead turns into sales then it is labelled as ‘won’ and a monetary value is assigned to it. #8 Your CRM stores all the lead data along with the corresponding GCLID values. #9 You download (or submit a request to download) the phone call lead data from CRM once a week or so. #10 You prepared the downloaded data for import into Google Adwords according to the conversion data import format outlined by Google. #11 You import phone call lead data along with GCLID value into adwords. #12 You correlate the imported offline conversion data with adwords clicks and impression data in order to optimize adwords campaigns for offline conversions. #3 You capture and store the GCLID value in a cookie. #4 The user browse the website and then see your lead submission form. #5 The user fill out the lead submission form and submit it. #6 As soon as the form is submitted, all the lead information along with the GCLID value is passed to your CRM (provided you are using a CRM like salesforce and it provides web to lead functionality). #7 You or your staff, qualify and categorize the form lead via the CRM. So if a qualified form lead turns into sales then it is labelled as ‘won’ and a monetary value is assigned to it. #9 You download (or submit a request to download) the form lead data from CRM once a week or so. #11 You import web form lead data along with GCLID value into adwords. #12 You correlate imported offline conversion data with adwords clicks and impression data in order to optimize adwords campaigns for offline conversions. Now let us go into the gory technical details of the implementation. #1 You use a CRM software like salesforce. #2 Your CRM provides ‘web to lead’ functionality so that you can send lead generation data from your website, directly to your CRM. #3 You use a phone call tracking software (like CallTrackingMetrics) so that you can track phone call leads from Adwords ads. #5 You have got an active Google Adwords account with autotagging enabled. #6 Your sales cycle is less than or equal to 90 days. This is because you can’t upload offline conversions more than 90 days old into adwords. Step-2: Capture and store the GCLID value in a cookie. Step-3: Retrieve GCLID value from the cookie and send it to your CRM along with other lead information. Step-4: Prepare your CRM data for import into Google Adwords. 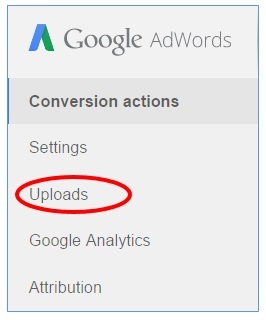 Step-5: Upload data from your CRM into Google Adwords. Offline conversion actions (also known as import conversion actions) are those conversions which are tracked in Google Adwords through conversion data import. # The conversion name matches in spelling and capitalization to the corresponding field name used by your CRM. Otherwise your offline conversion data import will fail. For example, if a new phone lead is referred to as ‘ABC Phone Lead’ in your CRM then name your conversion action as ‘ABC Phone Lead’ in Google Adwords’. # The conversion name matches in spelling and capitalization to the corresponding field name used by your CRM. Otherwise your offline conversion data import will fail. For example, if a qualified phone call lead is referred to as ‘ABC Phone Lead Qualification’ in your CRM then name your conversion action as ‘ABC Phone Lead Qualification’ in Google Adwords’. # The conversion name matches in spelling and capitalization to the corresponding field name used by your CRM. Otherwise your offline conversion data import will fail. For example, if a won phone call lead is referred to as ‘ABC Phone Sales’ in your CRM then name your conversion action as ‘ABC Phone Sales’ in Google Adwords’. Similarly, create new conversion actions for web form leads, ‘qualified’ web form leads and ‘won’ web form leads in Google Adwords. Whenever a user clicks on one of your adwords ad, the Google Adwords automatically append the GCLID (Google Click ID) parameter to the destination URL of your landing page. You need to capture and store the GCLID value in a cookie so that later it can be sent along with lead information to your CRM software. #1 Configure your CRM => Set up custom fields for storing the GCLID value in your CRM. Create one ‘read only’ custom field on each lead object (qualified web form lead, won web form lead, qualified web phone lead and won web phone lead). Check your CRM documentation or contact customer support for more details regarding creating custom fields. This hidden field will be later used to send GCLID value to your CRM. # 3 Create a client side or server side script to retrieve GCLID value from the cookie you setup earlier and to update the value of the hidden form field you just set above. Add this code immediately after the code you used to capture and store the GCLID value in a cookie but before the </body> tag. If your CRM can integrate with Google Adwords, you then don’t need to manually prepare your CRM data for import. It will automatically be converted according to the conversion data import format outlined by Google and imported to Adwords on a regular basis. For example, Zoho CRM can integrate with Google Adwords. Salesforce can also integrate with Adwords with the help of some third party tools. Download (or submit a request to download) lead data from your CRM at least once a week. This lead data should contain: Google Click Id, Conversion Name, Conversion Time, Conversion Value and Conversion Currency. If you ask your CRM support team that you want the lead data for importing into Google Adwords, then they are most likely to understand your requirement and send you data in the conversion data import format outlined by Google. You then don’t need to manually format your lead data according to the conversion data import format outlined by Google and can move straight to importing it in Adwords. Step-1: Download Google Conversion Upload template from here. Step-3: Open the template file and update the timezone value (HHMM) by your Adwords’ account time zone. Step-4: Add a new row for each offline conversion by filling in all the columns for: Google Click ID, Conversion Name, Conversion Time, Conversion Value and Conversion Currency. You can get this data from your CRM. Conversion name matches in spelling and capitalization to the corresponding conversion action in your adwords account. Otherwise your data import may fail. Conversion value can not be a negative number and it is an optional field. Conversion currency – use this field if your conversion values is in multiple currencies. This is an optional field. The template file should not include any personally identifiable information and/or additional columns. Double check your entered data before you start the import. This is because offline conversions once imported can’t be removed later. 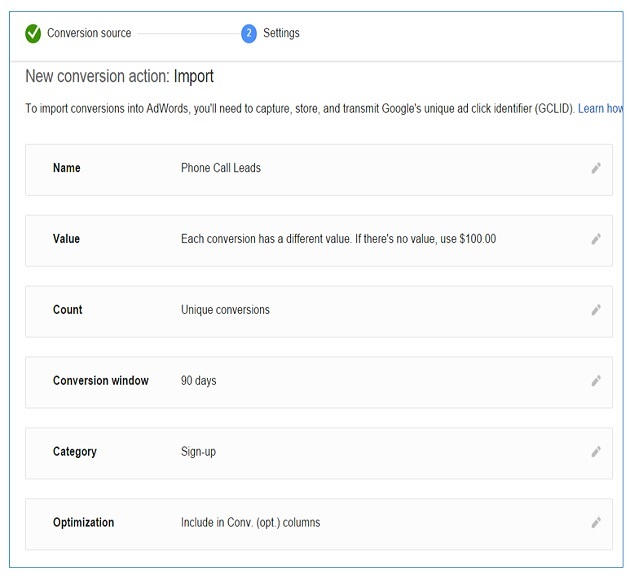 That’s how you can import offline conversion data into adwords.